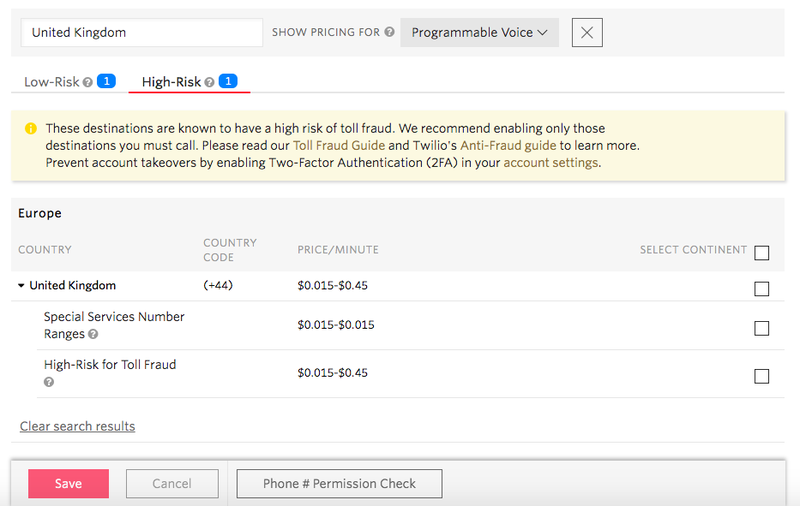 On this page, you will learn how to apply the appropriate Voice Dialing Geographic Permissions to enable calling 200+ countries and territories on the Twilio platform while reducing your risk from toll fraud. Continue reading to learn how to use the Console and if you prefer to use the REST API then see here. To learn about toll-fraud please see here. Permissions can be enabled in each country. Each country can have up to a dozen number types and hundreds to even thousands of number ranges unique to that country. Twilio has classified the number ranges that have the highest risk of telecom fraud. Now you can quickly enable calling to only low-risk destinations in each country while blocking calls to high-risk destinations in a few clicks. These number ranges consist of all number ranges Twilio has classified as low-risk. Only turn on calling to countries you need to call. Most mobile and landline/fixed number ranges fall into this category. Twilio has classified these number ranges to have high-risk of toll fraud. Most businesses never need to call these ranges so disable permissions to reduce your risk. There are two broad categories of high-risk destinations - High-Risk for toll fraud and Special Services Number Ranges. When the checkbox is unchecked, as seen above, that means calls will be blocked to these high-risk destinations, protecting your account from toll fraud. High-Risk for Toll Fraud - Most businesses never need to call these destinations and we encourage you to disable calling these ranges to reduce your risk. Twilio has identified thousands of very narrow number ranges, often in mobile/landline ranges, that are used for the sole purpose of terminating calls in toll-fraud attacks. The owners of these numbers receive revenue for every minute of voice calls placed to them. This fraud vector, also called International Revenue Sharing Fraud (IRSF), leads to $10 billion in industry-wide revenue losses annually. It is carried out across 200+ countries, across all number types, wide price ranges, and carried out by a well-coordinated team of criminals distributed around the globe. Since numbers can be bought and sold nearly instantly, Twilio updates the automatically multiple times per month, adding new high-risk ranges, and deleting ranges no longer believed to be risky. Twilio has classified these high-risk number ranges by analyzing millions of calls on the Twilio Super Network along with deep integration with anti-fraud databases. Twilio chooses to not disclose these number ranges to further protect your accounts. Twilio reserves the right to update this list without warning. We recommend that you only enable calling to low-risk destinations in the countries you need to call. Calling low-risk destinations still let you verify connectivity and quality for each country your business needs to call. Use 2FA to protect against account-takeovers and keep API keys private. Since Voice Dialing Geo Permissions are per subaccount, we recommend that you create a new subaccount for each customer. As a customer advances through the trust-value continuum, you apply the most applicable permissions. When a subaccount is created, it inherits Geo Permissions from the Master Project. In the Console, you can select to disable inheritance, and the permissions in the Project account will be copied to the subaccount. Then you can apply the specific permissions appropriate for the subaccount. See below for the top-10 countries with the highest amount of toll-fraud. Twilio Trial accounts can make calls to 200+ countries and territories worldwide. Trial accounts are limited to calling low-risk destinations only.